RG213UBX; 50 Ohm. High quality Sharmans cable with 7 strands of 20swg (0.035") plain copper centre core and plain copper braid with estimated 85% coverage. Solid polyethylene dielectric with a 66% velocity factor. Outside diameter 10mm. Suitable for use with RG8 N type plugs and PL259/9. £1.60/metre + P&P at cost. RG Mini 8; 50 Ohm. High quality Sharmans cable with 19 strands of 22swg (0.011") plain copper centre core and plain copper braid with estimated 85% coverage. Low loss foam polyethylene dielectric with a velocity factor of 80%. Outside diameter 6mm. Uses plugs with 7mm braid entry, such as PL259/7. Can be used with BNC plugs and also with RG58 N type if rear nut is drilled out 1/4". 80p/metre + P&P at cost. RG58C/U; 50 Ohm. High quality Webro cable with 19/0.18mm (26swg) tinned copper centre core and tinned copper braid with 90% coverage. Solid polyethylene dielectric with a 66% velocity factor. 100pF/metre, outside diameter 4.95mm. 60p/metre + P&P at cost. 100m drum £60 including carriage. URM76; 50 Ohm. High quality Webro with 7/0.32 plain copper centre core and plain copper braid 87% coverage. Solid polyethylene dielectric with a 66% velocity factor. 100pF/metre, outside diameter 5.0mm. 65p/metre + P&P. 100m drum £65 including carriage. RG174A/U; 50 Ohm. High quality with 7/0.16mm tinned centre core and heavy braided tinned copper screen. 98pF/metre, 2.8mm diameter. 75p/metre + P&P at cost. 100m drum £60 including carriage. Standard cables usually made to order within 48 hours. Though not shown here, all cables are finished with heatshrink at the cable entry to the connector to prevent rotation and as strain relief. PL259 plugs used with RG58 and RG59 are nice quality short shank. PL259 plugs used with MINI 8 and RG213 are good quality Sharman long shank types. TWIN FEEDER, 100 Ohm 2kW rated. 24/0.2mm cores individually polyethylene sleeved with an overall sheath of polyethylene. Cancels near field so doesn't emit an electromagnetic field and won't cause TVI. Both cores pick up the same noise so there is no noise differential between them and feeder is 0.4dB/m quieter than coax. Loss is the same as RG58U at 0.04dB/m at 10MHz. Price £1/metre, postage at cost. 100m drum £92.00 including carriage. 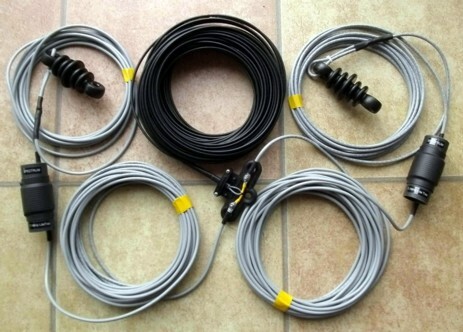 Replacement 21m length for full size G4CFY/G2DYM dipole, with ends made-off £27.50, plus £3.50 P&P. NEW LITE TRAPS for 10m, 20m, 40m, 60m, & 80m. Produced to satisfy the requirement for lighter weight traps. Probably the lightest traps on the market weighing just 40gm (1.1oz), 51gm (1.5oz), 72gm (2.0oz), and 90gm (2.6oz) respectively. The new design concept has made it possible to produce the long awaited 80m traps. The maximum power rating is the legal limit of 150W continuous 400W unprocessed peak power. Prices each 10m & 20m £27.50 each, 40m & 60m £30.00 each, P&P £4.50 extra. 80m £32.50 plus £5.00 P&P. These Spectrum Lite Trap Dipoles mark the next evolution from the original W3DZZ trap dipoles. Since buying the G2DYM business in 2006 I have changed the trap potting compound, then changed the top wire lengths, then changed the end insulators and centre piece. Then developed new multistrand low impedance feeder and now the design and construction of the Lite Traps without potting and with further modified top wire lengths. The low impedance twin feeder allows differential mode signals on receive and transmit to travel along the feeder without a measurable emitted electromagnetic field. On receive identical noise is picked up on both cores giving almost no differential feeder noise at the rig. It is so quiet using this feeder that at first you might think the aerial system is faulty. Supplied with 21m of twin feeder and a choice of 2.52mm or 62mm top wires. The feeder must be used with a 1:1 balun or balanced ATU in the shack. Prices below including tracking and insurance. An 80/40m Lite Trap Dipole in 6sqmm wire with 20m low Z twin feeder. 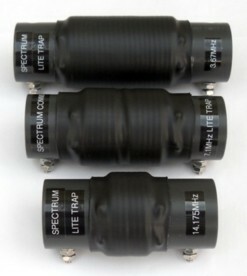 These Spectrum Lite Trap Inverted-L Aerials are essentially half a trap dipole with the feedpoint at ground level. Another way of understanding its operation is as a loaded quarterwave Marconi vertical with the radiating element bent over. The aerial is fed via coax to a coupling box secured to an earth stake at the far end of the garden. There is then a near vertical section, as high as you choose, and the remainder is near horizontal back towards the house. Because it is coax fed it is much noisier than the twin fed trap dipole. To work efficiently it requires a good ground. Supplied in 2.52mm or 62mm PVC covered wire and with the coupling box and U-bolts. Prices include tracking and insurance. 160 - 10 metres, air cored, 400W rated. Low impedance balanced to unbalanced. Loss <1dB 1-42MHz. For use in the shack in conjunction with 75/100 Ohm twin feeder. Price £40.00, carriage £5.00. 160-10 metres, air cored 400W rated. Suitable for low Z close spaced 75/100 Ohm twin feeder and for 300 Ohm ribbon or slotted feeder. Loss <1dB 1-42MHz. For use in the shack connecting directly into the ATU. Price £50.00, carriage £5.00. SLIM G TX & RX AERIAL. 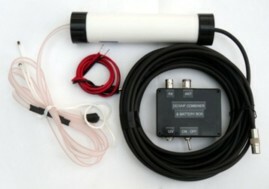 Manufactured for either 156MHz Marine band, or 145MHz 2m (Amateur) or 127.5MHz (Airband). This was previously called the GAREX JIMP and is essentially a portable version of the Slim Jim described by G2BCX in PW April 1978.Actually the aerial described as a J pole is really a misnomer as it really is a squashed letter G, hence the new name. It is ¾ of a wavelength long on either 156MHz or 145Mhz or 127.5MHz and achieves a gain of 1.8dBd, which is 12dBd (15 times) better than a 15cm rubber duck. The main element is fabricated using 300 Ohm twin feeder with a matching stub in a watertight housing. There is 4m of coax cable with a choice of BNC, or PL259 connectors. The 156MHz version is 1.3m long, the 2m version is 1.4m long and the 127.5MHz version 1.6m long and all folds down to 20cm. Weight is just 250g (9oz). Price £22.00 UK, £25.00 EU, £28.20 World. EU & World tracking £5.50 extra. NOMAD WIDEBAND PORTABLE SCANNER AERIAL 25-500MHz. The aerial element is made from 300 Ohm feeder configured like a Slim Jim, with modified stub matching to give greater operational bandwidth. It is intended to be portable but can be used as a permanent aerial in places where conventional wire aerials cannot be used. The overall length is 1.4metres and folds down to just 25cm (10"). It is fitted with 4m of 50 Ohm coax cable with a BNC male connector as standard, but can be supplied with PL259. For better reception of Air-band, 2m Amateur band or Marine-band use the Slim-G detailed above. Price £22.00 UK, £25.00 EU, £28.20 World. EU & World tracking £5.50 extra. ACTIVE NOMAD WIDEBAND SCANNER AERIAL 25-500MHz. Now with a new MMIC amplifier giving a flat gain of 10dB from HF to UHF. Overall length 1.4m. Ideal for loft or portable use. 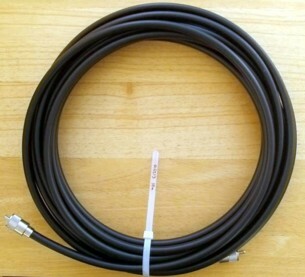 Includes 7m (23ft) coax cable. DC/RF combiner box with provision for 9V PP3 battery, or external 12V supply. 0.6m patch lead with choice of phono, BNC, or PL259 connector for receiver. Price £48.00 UK, £55.00 EU, £59.00 World, including tracking. New version with Mains Adaptor £63.50 UK, £73.75 EU, £80.25 World, including tracking. COMPACT HF ACTIVE AERIAL.500KHz to 30MHz. Ideally suited to permanent installation in marine environments and where other wire aerials would be unacceptable. It comprises a compacted element together with a wideband amplifier in a 420mm waterproof cylindrical housing together with an L mounting bracket and 7m length of coax cable with Belling Lee connector. The amplifier gives 21dB gain flat within 1.5dB from 680kHz to 30MHz. There is an adapter to provide DC up the coax to the aerial and the RF out via a 1.2m length of coax terminated with BNC or Phono or PL259 connector. Also a red/black power lead to connect between the adapter and a supply of 12/13.5V with a current of up to 20mA. Price £50.00 UK, £58.00 EU, £64.00 World, including tracking. 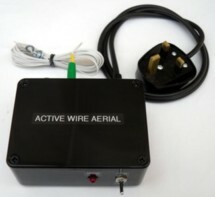 New version with Active Aerial Mains Adaptor £69.00 UK, £79.00 EU, £85.50 World, including tracking. ACTIVE WIRE AERIAL. 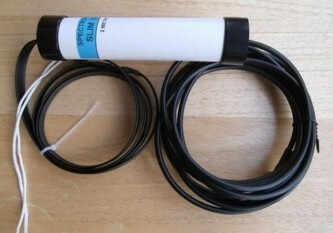 An active aerial for VLF to 30MHz and ideal for locations where an outdoor aerial is prohibited. The aerial is wire 5 metres long with 4 washers to allow it to be pinned to the wall or ceiling. It comes with a mains powered wideband amplifier with 15dB gain, flat across the band. Also included is a 1.2m BNC to BNC, or BNC to PL259 patch lead. Price £48.00 UK, £54.00 EU, £56.50 World including tracking. 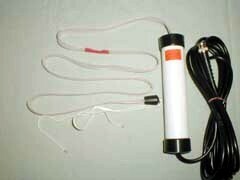 LONG WIRE PORTABLE AERIAL for receiving 2-30MHz. It comprises 14m (46ft) of PVC covered wire together with a 2m length of thicker PVC wire with a crocodile clip to provide an earth. The two wires are joined to a short length of coax cable with a PL259 connector as standard connector. Price £12.50 UK, £13.25 EU, £15.50 World. EU & World tracking £5.50 extra. FLEXIWHIP FOR HANDHELDS The FLEXI-WHIPS have a nylon cover and are fully waterproof and rugged. Solutions have been developed to allow the aerial to be supplied with a wide variety of plug or socket connectors. The maximum production length is 50cm, so for frequencies below 140MHz they are made as shortened loaded quarter-wave aerials, and above that frequency they are full quarter-wavelengths. A loaded 4 metre Flexiwhip can be made 50cms long. The shortening factor is a half and the gain reduction is a quarter, or -6dB, relative to 1 metre whip. Therefore the 50cm flexi-whip will provide about 12dB more gain than a 12.5cm helical. Connector options are BNC plug, SMA plug, SMA socket, TNC plug, PL259. FLEXIWHIP. Prices including carriage: Updated 25 August 2016. Flexi-whip for Wouxon KG699E 4m Handheld, 51cm long and supplied with SMA socket, £24.00. Flexiwhip for ICOM E90 4m handheld, 51cm long and supplied with SMA plug, £24.00. 2m/70cm dual band Flexi-whip for Wouxon, 49cm long with SMA socket, £20.00. 2m/70cm DUAL BAND MOBILE WHIP. This is a centre loaded whip with antiphase coil so the full 46cm length corresponds to 1/4 wave on 144MHz giving 0dBd (2.15dBi) gain. The antiphase coil allows the top section to be in-phase with the bottom section on 70cm to provide 3dBd (5.15dBi) gain. Robust and reliable ferrules connect the 17/7PH whips to the antiphase coil and the assembly is solid moulded in nylon. The aerial is supplied with a hinge adapter, or a 3/8" UNF stud, or even with a PL259 and includes a protective plastic tip. Price £24.00 including carriage. QUARTER WAVE WHIPS. These are cut from 2.54mm diameter 17/7PH stainless steel to suit any centre frequency in the range 68 to 450MHz. They are supplied with a hinge adapter, or a 3/8" UNF stud, or even with a PL259 and all include a protective plastic tip. 1/4 wave whips in the range 68-90MHz are two sections which screw together. Priced at £12.50 each including carriage. 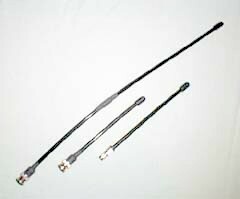 1/4 wave whips 90-450MHz are single section and are £10.00 including carriage. On 30th October 2006 Spectrum Communications acquired G2DYM Aerials. That business had run for exactly 30 years selling Trap Dipoles mainly to the Amateur Radio fraternity. Richard Benham-Holman G2DYM the previous owner had just had his 84th birthday and due to failing eyesight so was unable to continue running the business. The G2DYM Trap Dipole. This was based on the W3DZZ trap dipole design using a 7MHz dipole comprising two inner sections of 32 feet each, with 7MHz traps then a further 21 feet 7 inches beyond each trap. As standard it was supplied with 70 feet of 75 ohm twin feeder. A 1:1 balun was then used to convert to the unbalanced feed of the transceiver. The G4CFY Trap Dipole. Design equations show that the coax traps have a higher L to C ratio than used in the W3DZZ design and need to be used with an inner wire length of 33 feet and an outer wire length of 19 feet 7 inches to resonate in the middle of the UK amateur bands. This is 2 feet shorter overall than as sold by G2DYM. The trap potting compound and trap frequency accuracy are significantly improved. As standard the full size dipole is now supplied with 21 metres of high quality multistrand 100 Ohm twin feeder, and the half size aerial is supplied with 16 metres of high quality 100 Ohm feeder. In 25 January 2007 I have found an article from Technical correspondence in QST August 1976 which gave the equations to determine the net inductance loading required for a trap at a defined position on an aerial wire. These equations were tried for the W3DZZ dipole and gave the correct wire lengths for the middle of the American amateur bands. A program was then written to calculate top wire lengths and trap inductance and capacitance. Measurements of the 7MHz coax traps revealed an inductance of 12uH. The effect of connecting the inner from one end back to the outer at the other end effectively shorts out the inner to outer capacitance at low frequencies. At 7MHz the isolating effect of the intervening inductance allows the capacitance to total around 42pF. 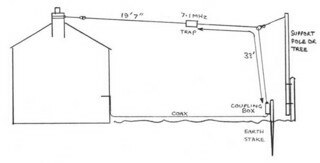 The equation run for the coax traps and UK amateur bands showed the G2DYM design to have the aerial top wire inners 1 foot too short each, and the outers to be 2 feet too long each. 8 August 2009. The twin core single strand low impedance feeder was liable to fracture at the cable grip on the centre-piece. It was also difficult to make-off and required time consuming work with sleeves, glue and heatshrink. No multistrand low impedance twin feeder could be found Worldwide, so I designed my own feeder. It is made using twin cores of 24/0.2 individually sheathed in polyethylene then with a solid moulded outer sheath of polyethylene. The solid construction avoids water ingress and it has good flexibility. When measured it revealed a characteristic impedance of 100 Ohms, which was a bit higher than intended, but still acceptable. The close spaced cores ensure virtually no differential noise pick-up. It is typically 0.5dB per metre quieter than wide spaced feeder and coax. On transmit the signal in the cores is equal amplitude but opposite in phase and cancels out any emitted field, thereby minimising TVI. All but one person who has purchased it have been really impressed with its construction and performance. It must be used in conjunction with a 1:1 Balun. Characteristic impedance 100 Ohms, 2kW power handling, 0.04dB/m loss at 10MHz (much the same as solid dielectric coax), weight 27gm/m. 5 October 2009. New traps were perfected for 14.15MHz for use with a half size dipole. 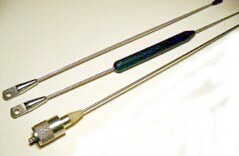 Top wire lengths were calculated and several aerials were sold using those length. Results were very encouraging but resonance was slightly higher than desired. Addition of 4 inches to each inner brought the resonance into the middle of the bands. The total length is now 54 feet. 26 March 2010. A new version of the 1:1 Balun is now available. It includes switching to join the twin feedline wires so the aerial can be tuned against ground as a Marconi T. This means the 80 to 10m trapped dipole can now be loaded up on 160m, and the 40 to 10m trapped dipole can be loaded up on 80m. Using an aerial in Marconi-T configuration requires that the twin feeder is well away from support masts and has no long run close to ground. 20 October 2014. A new design of trap was developed with a lighter tube as well as small and lighter winding. This was now enclosed in an adhesive heatshrink with low dielectric constant and good heat characteristics. It is possible that this design will radiate heat from the winding better than the previously epoxy potted trap. New versions for any frequency are now relatively easy to produce and initially I have produced traps for 28.5MHz, 14.175MHz, 7.1MHz and 3.65MHz. The new L-C ratio of these traps requires different top wire lengths than previously used and the popular 80m trap dipole now is 104ft 6" which is 1ft 6" shorter than the former version.